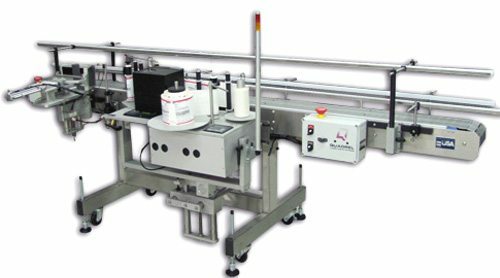 This labeling system features our heavy-duty printer applicator and a secondary pneumatic cylinder impresser. Pails are manually loaded with the handles riding on the guide rails. Products are aligned by a guide rail and driven by a lug on the conveyor. The system prints and applies a label to the side of the pail. The secondary pneumatic cylinder impresses the remainder of the label around the side of the pail.